KABUL — Top staffers at an Afghan newspaper are being investigated for blasphemy after the publication of an article that questioned whether Muslims should embrace the possibility that more than one God exists. The investigation, apparently being led by intelligence and cultural affairs officials, came at the request of Afghanistan’s new president and chief executive officer. Afghan officials stressed Wednesday that no arrests have been made. The investigation could pose an early challenge for President Ashraf Ghani as he seeks to balance the wishes of Afghanistan’s conservative religious community and the expectations of Western governments, including in the arenas of press freedom and religious dissent. Faced with skepticism among Islamic leaders about his past ties to the West, the former World Bank official had worked hard to burnish his conservative credentials during a June presidential runoff against Abdullah Abdullah, who is now the country’s chief executive as part of a power-sharing arrangement. 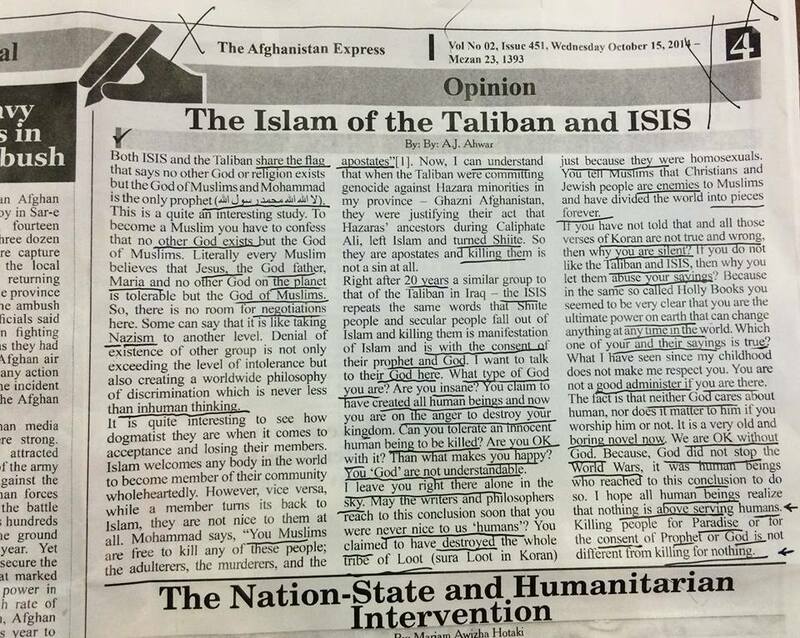 The English-language article at issue was published Oct. 15 in the Afghanistan Express, which bills itself as “the voice of a more hopeful generation.” It was marked as “Opinion” and titled, “The Islam of the Taliban and ISIS.” The radical Islamist Taliban movement was ousted in 2001 after five years of repressive rule in Afghanistan and has been waging an insurgency since then. The Islamic State, an exceptionally brutal al-Qaeda offshoot also known as ISIS and as ISIL, has captured large portions of Syria and Iraq this year in its bid to create a vast Islamist caliphate. “Maria” apparently refers to the Virgin Mary. The article goes on to critique whether the Islamic faith provides too much space for groups such as the Taliban and the Islamic State to flourish. “I want to talk to their God here. What type of God you are? Are you insane?” the author asks. A prominent Islamic scholar, Abdurrab Rasul Sayyaf, condemned the article and labeled it “perverted.” Sayyaf, who was a jihadist leader during the Soviet occupation of Afghanistan in the 1980s, called for the author to be immediately arrested and punished, according to Afghan news accounts. To quell the uproar, the editor of the newspaper apologized this week to readers. The editor said that the article was submitted by an Afghan living abroad and that it should never have been published. The letter to readers was unsigned, and the editor did not want to be identified because of fears for his safety. Despite the apology, reaction from Afghan authorities was swift. On Monday, the government’s Council of Ministers determined that the article violated “the values and principles of the Islamic religion,” according to the minutes of the meeting, which was chaired by Abdullah. “The government of Afghanistan will take strict measures against those involved behind publishing this blasphemous article,” Abdullah said during the meeting. Under the Afghan constitution, written after the fall of the Taliban, residents have the right to “free expression,” and non-Muslims are free “within the bounds of the law” to practice their religions. Afghanistan is also governed by sharia, which prohibits anyone from insulting Islam. On Tuesday, the issue came up during a meeting between Ghani and a group of visiting religious scholars at the presidential palace. Ghani told the scholars that the article was an “insult to the entire Muslim” community and that the Ministry of Information and Culture would be “seriously following up on the issue,” according to Fayeq Wahedi, a Ghani spokesman. On Tuesday evening, Afghanistan’s Khaama Press agency reported that arrest warrants had been issued in the case. A former staffer at the newspaper told The Washington Post that several people with ties to the publication had been detained. But spokesmen for the Interior Ministry and the National Directorate of Security said Wednesday that no decisions about arrests have been made. If convicted of apostasy, the most serious possible charge in the case, defendants could face the death penalty, said Nasrullah Stanekzai, a law professor at Kabul University. Otherwise, he said, blasphemy is punishable by up to 20 years in prison. Ahmad Quraishi, executive director of the Afghanistan Journalists Center, said he hopes the government shows leniency. The case has surfaced just as it appeared that Ghani and Abdullah — both of whom have spent considerable time in the West — would show more tolerance for press and religious freedoms than was seen under Hamid Karzai, whose presidency ended in September. In late August, amid an election dispute between Ghani and Abdullah, Karzai’s attorney general expelled New York Times reporter Matthew Rosenberg, accusing him of trying to destabilize the country. Rosenberg, citing anonymous sources, had reported that security officials were preparing to seize power if the Afghan election stalemate continued. Within days of taking office as president, Ghani reversed the expulsion. Afghan progressives also have been encouraged by the emerging public role of Ghani’s wife, Rula Ghani. A Lebanese-born Christian who also has U.S. citizenship, she recently told the Los Angeles Times that she plans to become an advocate for Afghan women and children.